As mesmerizing as it is frustrating, Beasts of the Southern Wild is a rich aesthetic force of sweeping ambition. Not since The Tree of Life has a picture left me with such a sense of hesitation in addressing its strengths and weaknesses. 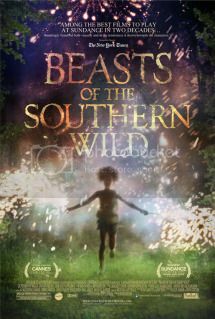 But as undeniably original and compelling as it may be, Beasts of the Southern Wild fails to register for anything more than its visceral qualities. The dense material that director Benh Zeitlin addresses lacks cohesion, coming across as more jarring than insightful. The film’s powerful imagery assaults the senses, but due to Zeitlin’s perpetually moving camera, it’s difficult to exercise much thought in the way these images are linked together. Whereas The Tree of Life possessed such a high level of finesse in its composition, Beasts of the Southern Wild is too choppy, more concerned with auditory delights, therein handicapping its broad attempts at poetic lyricism. Aside of some of the film’s formal issues, I take umbrage with Beasts of the Southern Wild’s naïve worldview. Zeitlin frames the poverty stricken people of the Bathtub (a shantytown located off the coast of Louisiana) with an aura of nobility. Their joyous communal lifestyle is most effectively conveyed in the picture’s opening sequences and compelling inner dialogue (as expressed by the picture’s lead actress, the young Quvenzhané Wallis). As Hushpuppy, Wallis operates as the innocent vessel in which the audience views others. But the world Hushpuppy inhabits is an ugly one, not just for its superficial qualities, but for its apparent rejection of improving their social and economic standing. I’m hard pressed to believe that this is the intent of the filmmakers, but there seems to be a lot of ridicule placed on government intervention for such a dilapidated community. While this critique stems from my own political leanings, the subsequent demonization of helping another human being operates in opposition to a lot of the rhetoric that shapes Beasts of the Southern Wild. For a film that flourishes in its observations of communal living, the moment it subscribes to a dramatic element, we witness a sharp rejection of some of rudimentary components that make communal living possible. Beasts of the Southern Wild’s greatest asset lies in its anthropological observations. The way in which particular aspects of one’s identity is shaped by the environment is a something the picture truly excels in conveying. With an opening sequence that establishes the intense familial bond of people in the Bathtub, the film makes a point of establishing the joy in which these people have for their land and community. Zeitlin impresses further by introducing supernatural elements to the picture. The two concepts, the people of the Bathtub and the mythic stories that surround the area, coalesce wonderfully. But where Zeitlin stumbles is through his embrace of a tidy narrative structure to complete his final act. The picture sprints through over half of its runtime with unshackled restraint, only to descend into convention. Beasts of the Southern Wild has individual moments of such emotional immediacy that it’s going to be hard shaking from my memory. But on the whole, its troubling politics and uneven construction shrouds an impressive ambition and scope.